Born - Abt. 1798 - Kentucky, U.S.A.
Died - Aft. 1850 - Indianapolis, Marion County, Indiana, U.S.A.
"John Thomas, age 49 b. Abt. 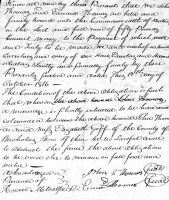 1801 Kentucky, landlord; real estate owned $1000; four children b. Kentucky: Francis Mary. 22 cabinetmaker, Sarelda 19, John J. 10, Elizabeth M. 8. Also in the household: Maria Parks, age 43 b. Abt. 1807 Kentucky." ". . . When he [John Mitchelltree Thomas] was four years old , his parents moved to Indianapolis, Marion County, Indiana, where his FATHER died a year later. . . ."
Actually, John Shaw Thomas was enumerated in 1850 in Nicholas County, KY. 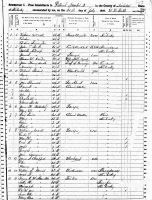 It was John Mitchelltree's step-father, Adam Rozier, who moved to and died 20 Oct 1845 in Indianapolis, Marion County, Indiana.